With work continuing on Shoreline Boulevard for the next few months, readers might be interested in looking at past plans to beautify the bay front. In January 1912, the city approved the purchase of 150 palm trees at a cost of $5.25 each to line Shoreline Drive and make it more attractive for visitors and locals. That was the start. From there, many plans have found their way to the council chambers but none quite like the one planned by a visionary sculptor and a Chamber of Commerce president. 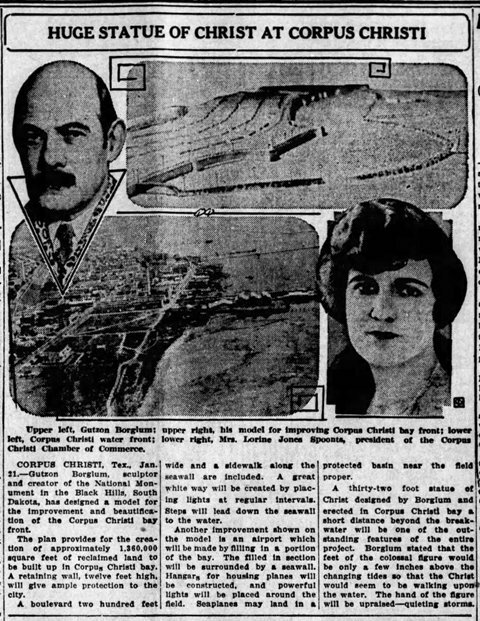 This January 22, 1928, news piece will certainly peak the interest of anyone interested in the history of Corpus Christi or the future of the bay front. It seems that many plans have been developed over the years concerning what should happen at this site. 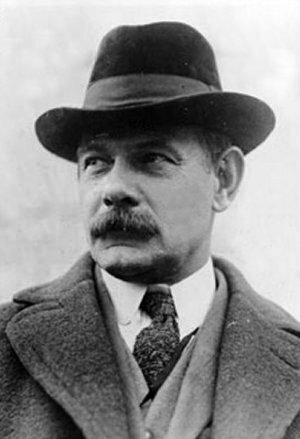 Even Gutzon Borglum, world-renowned sculptor and creator of Mt. Rushmore, the monumental sculpture of larger-than-life Americans, had a vision for Corpus Christi. The article below ran in the Albuquerque Journal in 1928. Lessoff also makes mention of two Mexican artists who, in 1971, showed up in town with a model for a “sixteen-story steel-and-marble colossus, envisioned as a bicentennial gift from Mexico.” There was a glitch in the arrangement of the reception, and they were left displaying the model at a local mall. This was closely followed in August 1979 by another rejected statue proposed by Sherman Coleman, a local surgeon and sculptor. A lawsuit was threatened to prevent erection of the statue on a city-owned spoil island. By 1995, the idea of a Christ statue overlooking Corpus Christi Bay came to fruition at the hands of a local, Swedish-born and internationally renowned sculptor, Kent Ullberg. The First United Methodist Church commissioned Ullberg to create a fifteen-and-a-half-foot bronze of Christ stilling the waters. The statue stands in front of the church on Shoreline Boulevard. I can only imagine what Corpus Christi would be like now if Borglum’s plan had been carried out. Artwork that would rival the Statue of Liberty itself would have certainly had an impact on the people who live here and those who would find their way here to see such a wondrous monument.